Cloud computing has ushered in many fantastic new business solutions. But, with certain technologies sounding as though they do very similar things, business owners can often be confused as to which one suits them best. Nowhere is this perhaps as true than the world of remote desktop. In this article, we’re going to look take a closer look at two different remote desktop solutions: hosted desktop – also known as Desktop as a Service (DaaS) – and virtual desktop – also known as Virtual Desktop Infrastructure (VDI). This will help you get a better understanding of what they are, how they differ, and which is best for your business. Hosted desktop or DaaS is an IT solution that allows businesses to host company computers in the cloud. 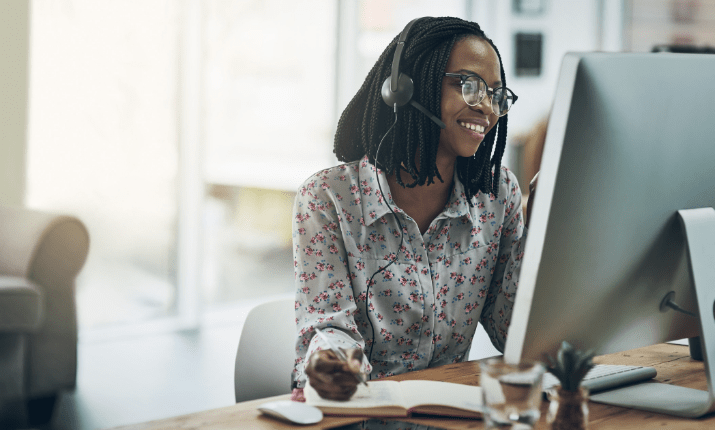 With DaaS, your desktops will not be connected to in-house servers, meaning that your hosted desktop provider will be responsible for resource provisioning, load balancing and network management. Because your desktops will be hosted in the cloud – i.e., they are stored in a third-party datacentre – your staff will be able to access their desktop, data and applications anywhere, anytime. Additionally, good hosted desktop solutions enable streaming to almost any device. Virtual desktop or VDI offers similar functionalities to hosted desktop. The critical difference is the way the solution is set up. Instead of hosting desktops in a third-party datacentre, your in-house IT team will be responsible for desktops in your own datacentre. This gives a business an IT solution that can be controlled centrally – making it easier to manage provisioning, updating, patching and software distribution. As with hosted desktop, your staff will be able to access their work desktop remotely, meaning they can work from anywhere. Make sense? Good. Although hosted desktop and virtual desktop are very similar, it’s crucial that business owners understand that they are not the same. Importantly, many businesses may find that one or the other better matches their needs and resources. When it comes to weighing up hosted desktop and virtual desktop, business owners need to think about their priorities. Is it essential for them to retain complete control? Are high up-front costs an issue? Do they possess the infrastructure needed to integrate their chosen remote desktop solution? 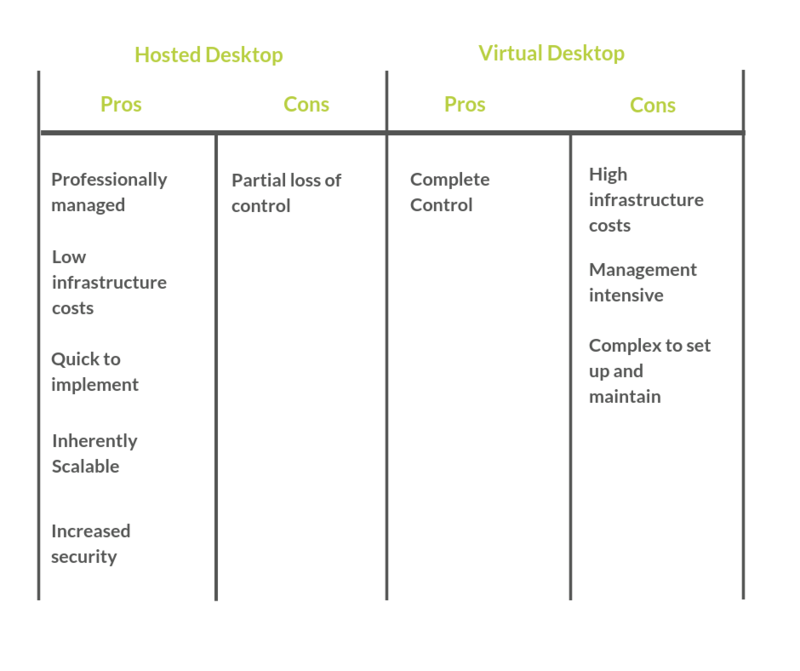 In terms of VDI, the biggest benefit is control. Because the solution is set up and managed by a business’s internal IT team, virtual desktop allows businesses to retain complete control of their IT solution. This can be important for businesses operating in certain industries – such as finance and law. Of course, this also means that businesses which choose VDI will place an increased workload on their IT departments – and will not benefit from the increased security that a good hosted desktop provider delivers. Additionally, setting up VDI is complex and time consuming, as well as expensive. Because a VDI solution is managed in house, typically, businesses need to make a significant initial investment to get access to the software and purchase the hardware required to run it. On the other hand, hosted desktop requires very little initial investment since the solution is usually sold on a subscription basis and does not require a business to own its own datacentre. This allows many businesses that couldn’t implement VDI to benefit from a remote desktop solution. And, because hosted desktop is managed by seasoned professionals – using state-of-the-art infrastructure – businesses which choose to go hosted benefit from a reduction in internal IT provision, access to industry-leading expertise and the use of hardware that would otherwise be outside of their budget. Hosted desktop also provides significantly increased security. A good hosted desktop provider will store your data in an enterprise-grade datacentre – equipped with the latest physical and cyber security measures – meaning your data will be properly secure. Such datacentres offer capacity far beyond what most businesses can typically afford themselves. This means that hosted desktop is inherently scalable: whenever your requirements expand, your provider will be able to meet them quickly. For more hosted desktop benefits, see our recent article, “8 Reasons Your Business Should Consider Hosted Desktop”. Whatever remote desktop solution you choose – hosted or virtual – your business will enjoy some significant benefits. Firstly, remote desktop allows your staff to work from any location. This means that salespeople on the move, those who need to work from home and people working out of hours can continue to work just as efficiently from any location of their choosing as they can from the office – leading to increases overall business productivity and efficiency. Secondly, businesses which choose a remote desktop solution enjoy a more engaged, happier workforce. In fact, according to Forbes, 31 percent of employees claim to waste at least one hour a day, 16 percent waste at least two hours a day and six percent waste at least three hours a day. Surprisingly, many of the reasons cited for such large amounts of wasted time are only experienced in the office. These include noisy co-workers, gossiping, unnecessary meetings and unsolicited drop-byes. Conversely, remote workers have been shown to be 13 percent more productive than their in-office counterparts. This is because, according to Tech.co, they regularly work more post-business hours (not so much of an issue when you don’t have a commute), have less downtime and sick days and enjoy a dedicated, distraction-free working environment. Thirdly, remote desktop is inherently environmentally friendly. Today, it’s important that businesses take responsibility for their environmental impact. Hosted desktop solutions significantly reduce energy use and carbon emissions, making them more environmentally friendly than traditional IT solutions. This can help businesses meet the requirements needed to achieve green certificates. Elite Group is the leading unified communications and technology provider. We supply businesses with industry-leading hosted desktop services supported by our expert engineers and support team. All content © Elitetele.com PLC 2018, trading as Elite Group.